Whether you’re planning on using it for carving, commuting or popping to the shops, an electric skateboard is an incredibly handy thing to own. With the potential to reach speeds of up to 25mph, they’re surprisingly swift but choosing the best electric skateboard comes down to more than just how fast it moves, with other aspects like range, power and weight to consider. The best electric skateboard will offer you a powerful motor for assistance on the inclines while still delivering on the range so you’re not charging up every five minutes. It’ll also need to be light enough for you to revert back to scooting, should the juice run out. The Yuneec Electric E-GO Cruiser Skateboard meets all this criteria, and for a price that doesn’t break the bank. If speed is more important than range, something like the Koowheel Electric Skateboard Kooboard will serve you well, so long as you can sacrifice a bit more of your income and you don’t mind putting in the leg work if the battery runs out of power. The E-GO manages both style and function, with its streamlined kicktail shape, powerful battery and energy recovery when it breaks. While it’s not the fastest on our list, when it comes to having enough juice to get you to the shops and back (several times), this skateboard is definitely a top choice. Weighing in at just 6.3kg, the E-GO is light enough to be used manually. There’s a range of funky colours to choose from, you can control it via your smartphone or the remote and you can charge your phone up using the integrated USB port! Featuring two custom high powered motors, the Marui skateboard promises to deliver on speed. With a slow mode and high speed mode, you can control the amount of energy it uses up, which is great if you’re planning a longer journey. It boasts regenerative braking to conserve energy, while the battery only takes 3 hours to fully recharge. With users commending the quality of the board, trucks and wheels, aside from being a touch heavier than the Yuneec, it’s a pretty decent alternative. Not everyone lives in town, so when the easiest way for you to get from a to b is down a walking track or a field, you know you’re covered with the Ninestep. As a mountainboard it features pneumatic tires, while its two brushless motors are capable of powering it up inclines as steep at 30 degrees. With top speeds of 25 miles an hour, it’s faster than the other two, however the compromise is in the weight – at 13kg, it’ll be hard work scooting it if the battery runs out. 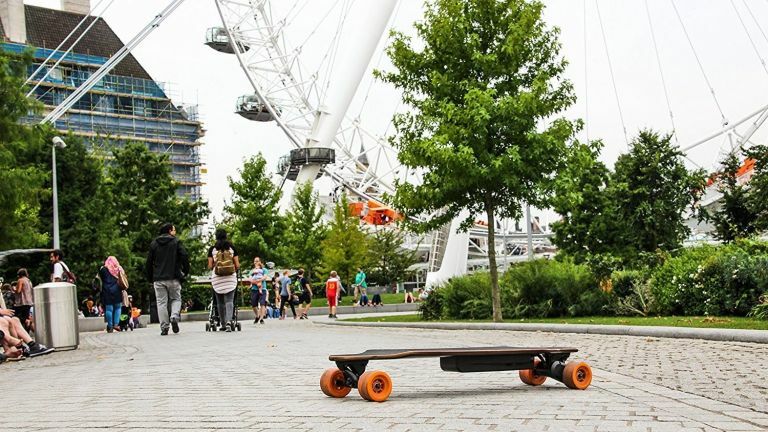 With Koowheel boasting that they’ve used the latest state-of-the-art technology to make this board, we’re pretty sure it’ll fair you well, whether you’re using it for leisure or the morning commute. Thanks to the lightweight parts, the electric skateboard only weighs in at just over 7kg, so it shouldn’t be too hard on the legs if it runs out of juice. The wireless remote features gear control and a throttle for braking and accelerating, and there’s even a USB port to charge your device up. When it comes to daily commuting, the Max-Eboard has you covered. Rain or shine, the anti-splash and dust-proof motors will power through with the top speed of 20mph getting you to the office in a flash. If you aren’t quite confident enough to handle the top speed, there’s two lower settings to choose from. While its range isn’t quite so good as some of the others, its cruise control function is handy for conserving power, and the regenerative brakes also produce power to further extend the battery life.